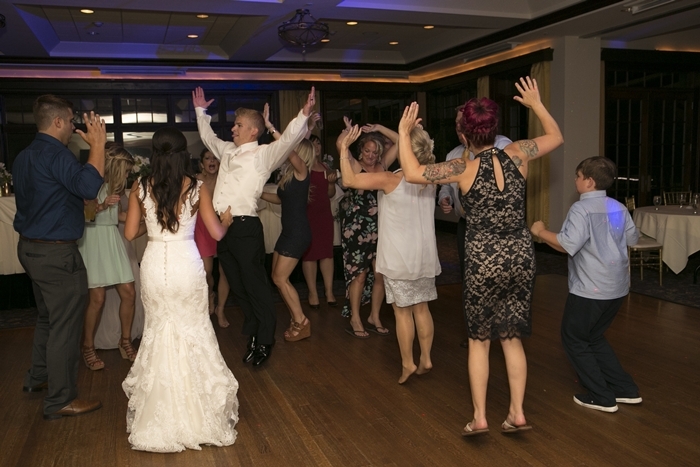 My son married his college girlfriend this past summer and I finally have photos to share with you! Will you indulge me while I relive the memory here on my blog? 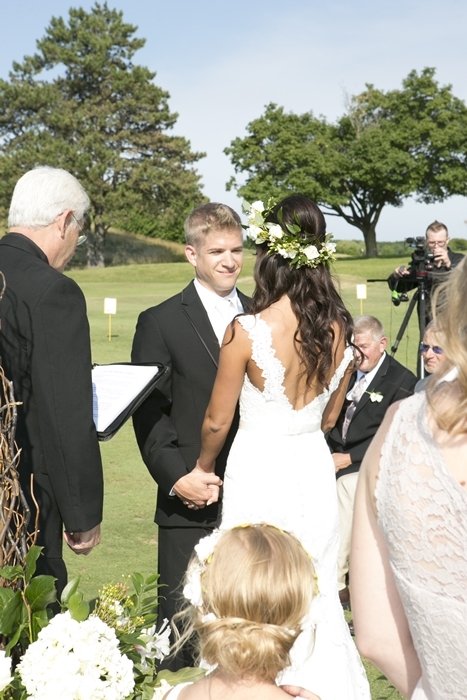 Their summer wedding was held at Makray Memorial Golf Club in Barrington, Illinois. 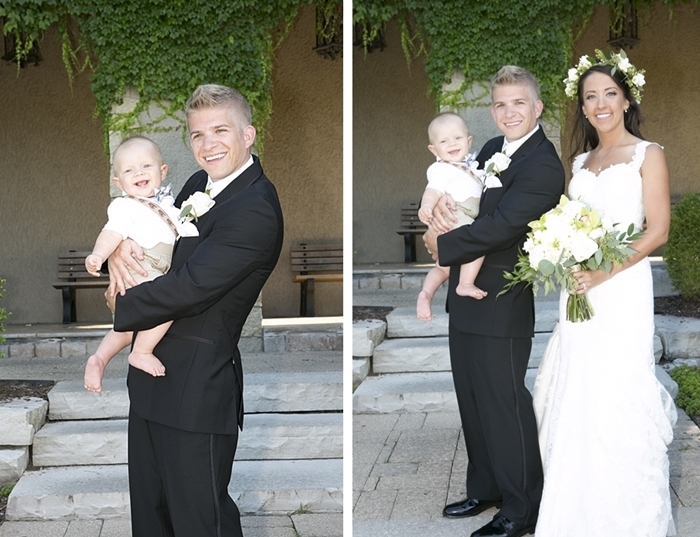 The weather was perfect, the bride was beaming, and my son looked rather dapper in his tuxedo. All photos (except the beach photo) were taken by The Wedding Studio. 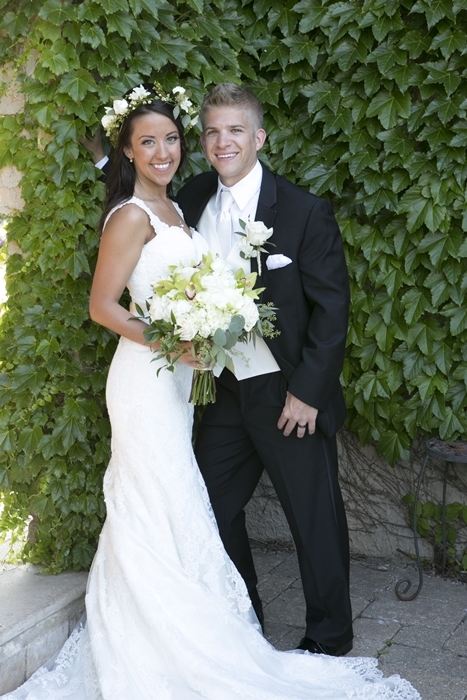 These two met while attending Illinois State University and have been together ever since. 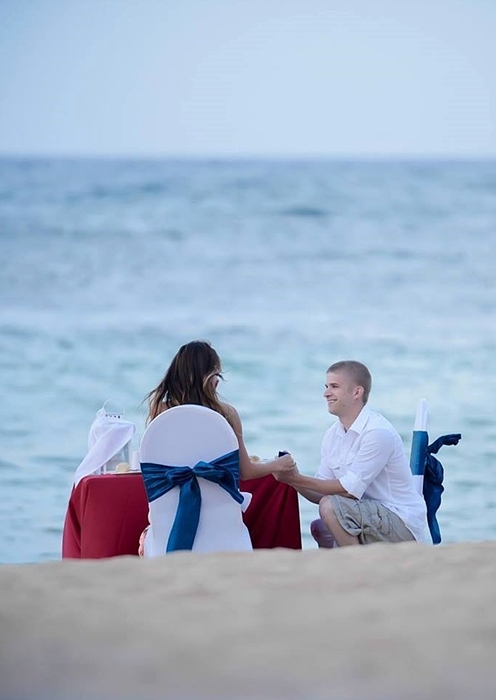 Cory proposed to Amy on the beach at Punta Cana. He arranged the romantic dinner and found a photographer to capture the moment. Sometimes he surprises me, but if you’re a parent, maybe you understand that we often still think of our grown children as the little tikes they once were. 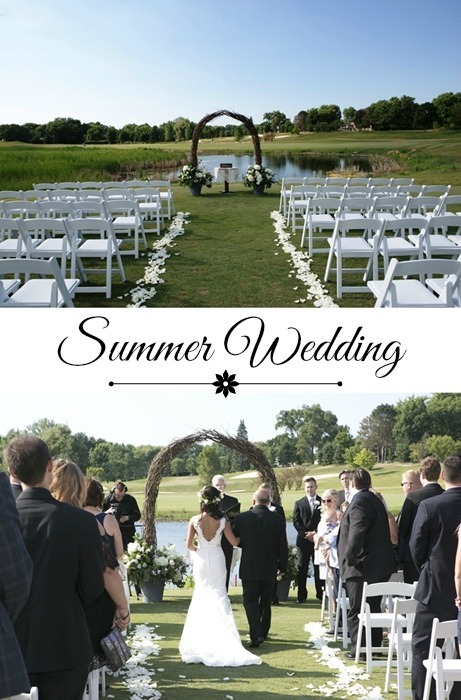 The summer wedding ceremony was held here at Makray Golf Club on July 3rd. 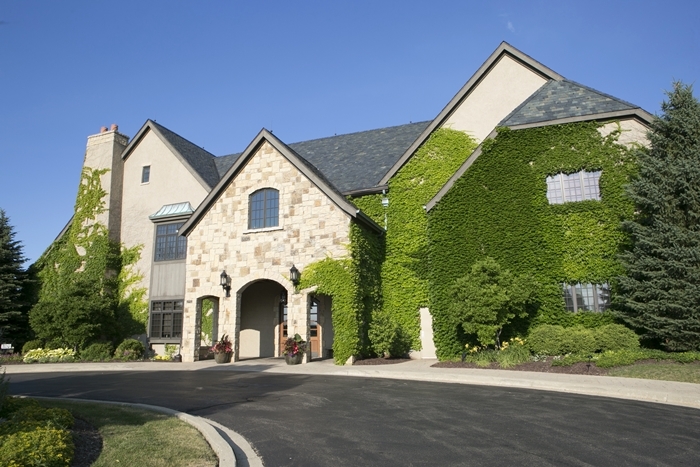 The building has beautiful architecture inside and out, which is part of the reason Amy and Cory chose it for their special day. The morning of the wedding, we were all at a nearby hotel getting ready. That’s me on the right; I love having someone else do my hair. Amy and my daughters are on the bottom. After my hair was done, I went down the hall to check on Cory who was having trouble figuring out the cuff links. Hours later, everyone was dressed and ready to go. 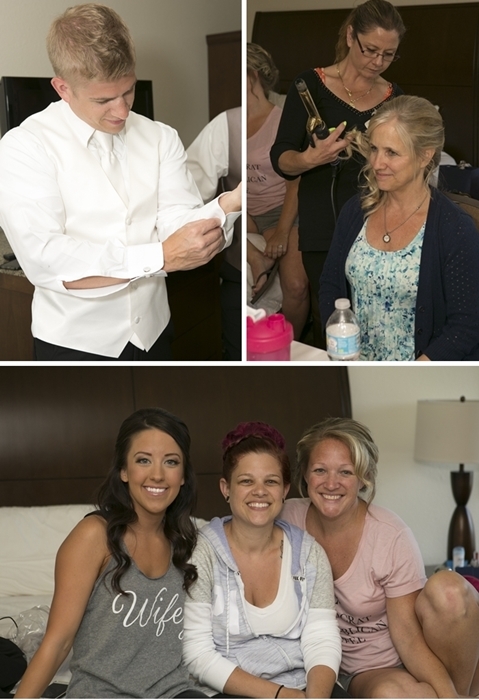 I don’t know why it takes so long to do hair and makeup, but it always does for a special event like a summer wedding. 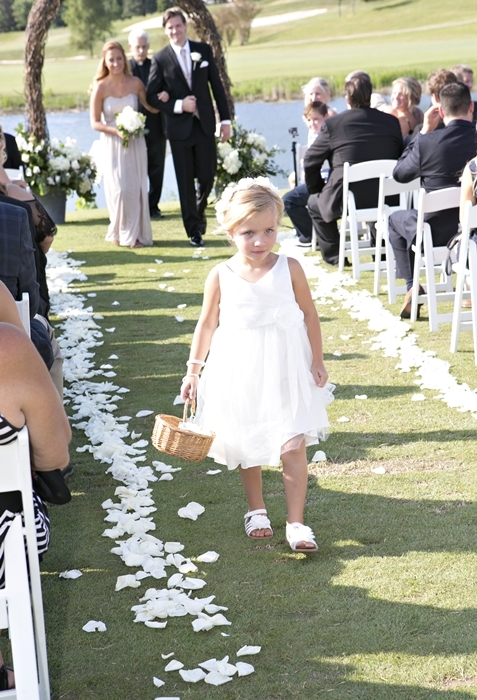 My granddaughter Zoe was the flower girl. She likes having her hair done, too! 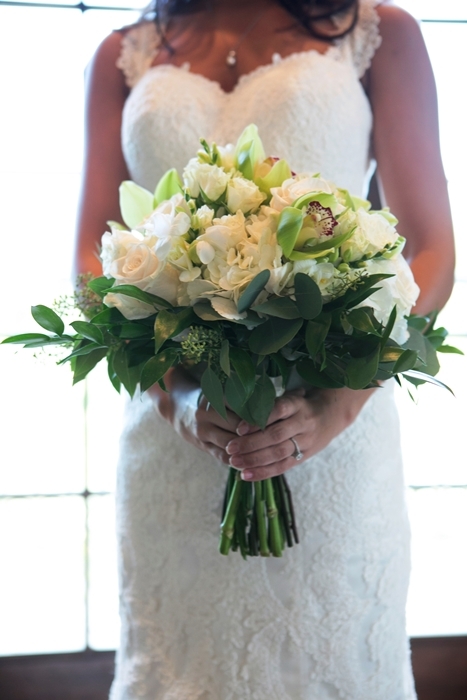 Amy’s dress was made of beautiful lace and her bouquet was mostly white, with a bit of eucalyptus and other greens. I love wedding dresses like Amy’s that have buttons down the back. 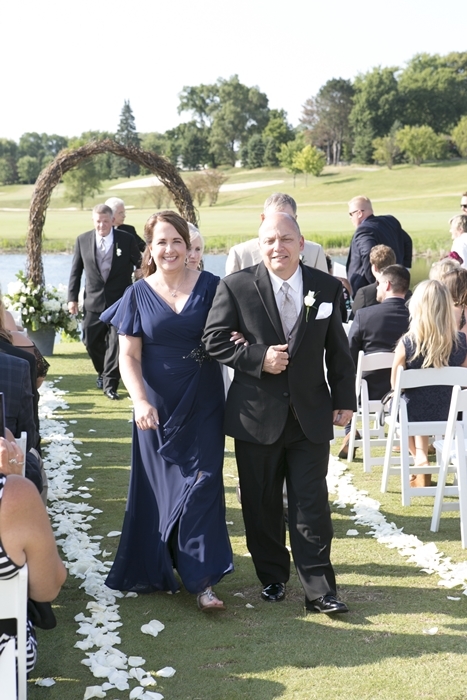 Amy and Cory’s summer wedding ceremony was held outside near the golf course pond. Zoe was a little shy and didn’t like having all eyes on her but she did a good job. You can see her brother in the background, watching her walk down the aisle. The parents of the bride … we’ve become friends and I have to say, it’s so nice when you like the in-laws! A few family photos … with Cory, walking toward the ceremony with hubby, and my family and my sister’s family with the bride and groom. My dress was a silver gray swing dress with sequins on the bottom portion and chiffon on top. My grandson picked out my silver sandals! He had the lucky job of shopping with Grammy for her ensemble. This is the lucky grandson who went shopping with me. He’s the brother of the flower girl. Little Boo Bear with Uncle Cory and his new Aunt Amy! The girls in their beautiful gowns. On to the reception where guests signed a leaf on the tree. 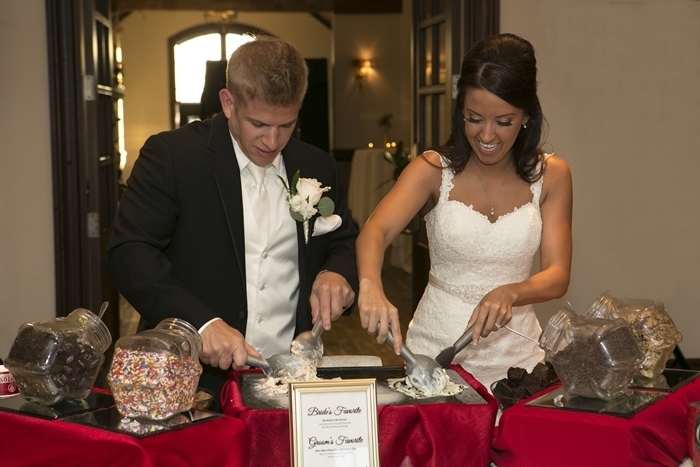 Amy and Cory had an ice cream bar, and they each made a signature sundae that guests could order after dinner. 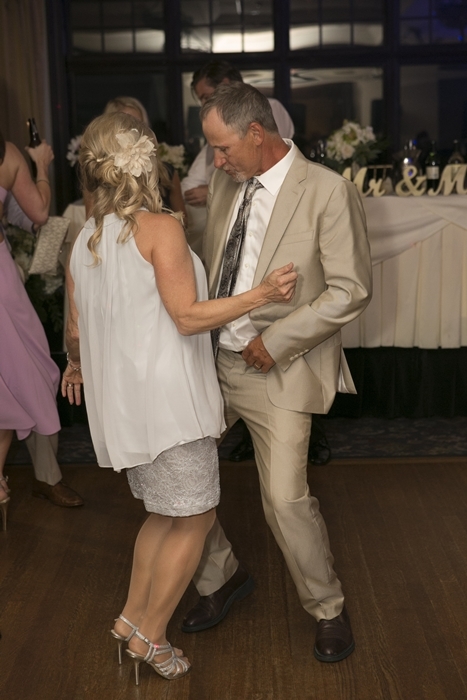 Hubby still has some sweet moves! Ha! Hope he doesn’t mind me sharing his dance moves with the world. I wish them well in their new life together! Luckily they live nearby so we get to see them often. 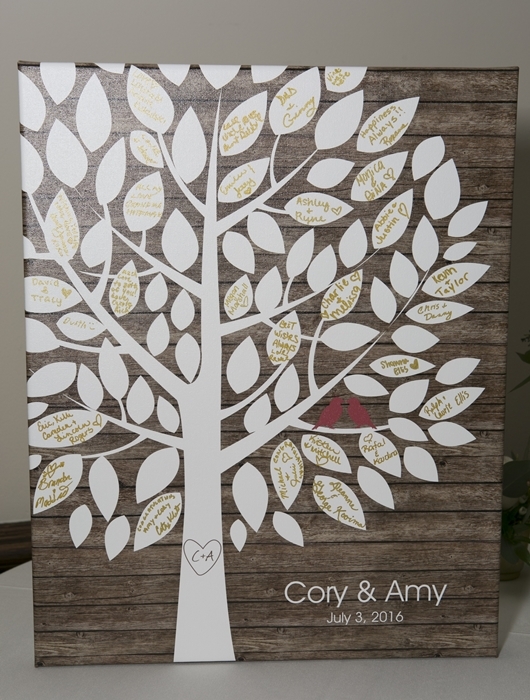 Congratulations Amy and Cory! 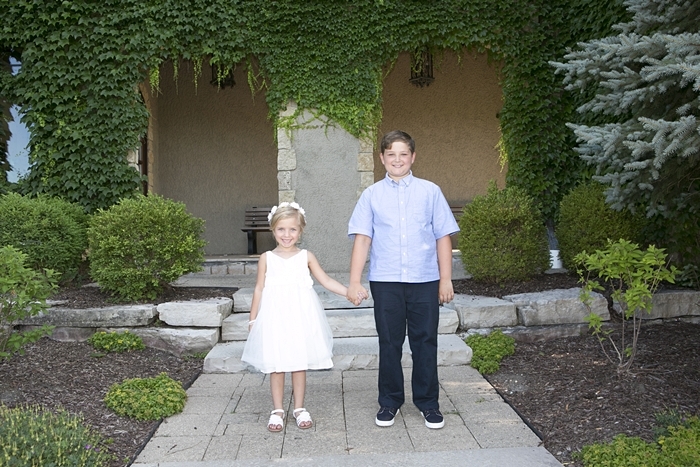 I loved your summer wedding! And thanks to all of you for indulging me while I shared this special event with you! Best Wishes to the bride and groom they look very happy. Her gown is beautiful. I hope your blog Iook forward to reading it everyday. How sweet, and what a beautiful day. Love that your grandson picked out your sandals. Love your dress by the way. Blessings to the lovely couple. What a beautiful couple and you all had a beautiful day! Thanks for sharing such a special day. 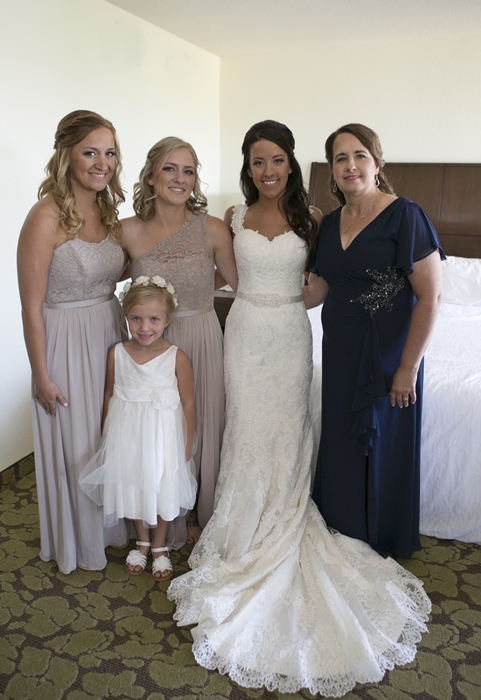 I know our daughters wedding day was one of the best and happiest days of my life. Have a great weekend. You looked beautiful too!!!! Oh what a beautiful wedding and beautiful couple. You and hubby look pretty amazing too. Thanks for sharing, gorgeous pictures. Oh what a lovely wedding. And a beautiful couple! Congratulations! Thanks for sharing this lovely day. Thank you for sharing this precious moment , it was lovely and what a great family you have. Love the last pic! Congrats ! Stunning – all of it! Loved the dress, loved your shoes, loved the photo of the scrabble pieces with the rings. Hubby and I have been together ten years and married for eight. And my mum still pulls out the DVD every year at our anniversary and relives the day! Super memories! Simply beautiful. I loved your dress. 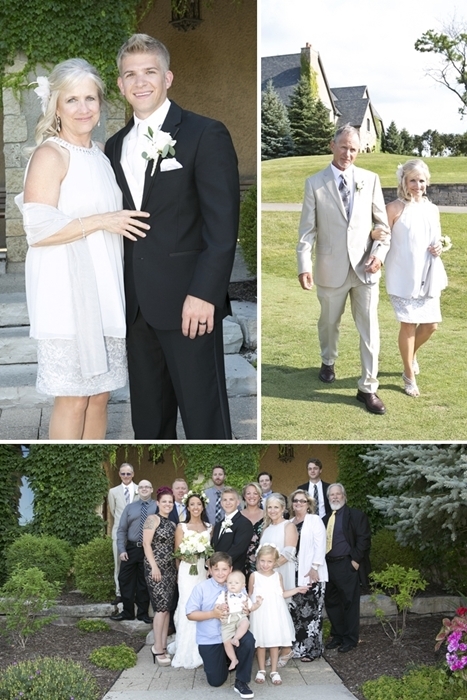 What a special day filled with family memories. Best wishes to the happy couple. Beautiful couple and beautiful wedding. Their pictures are gorgeous. Jennifer you look so pretty for this special day. What a beautiful family you have. Congratulations to the happy couple, we wish them a lifetime of love and happiness. Beautiful day, beautiful couple. 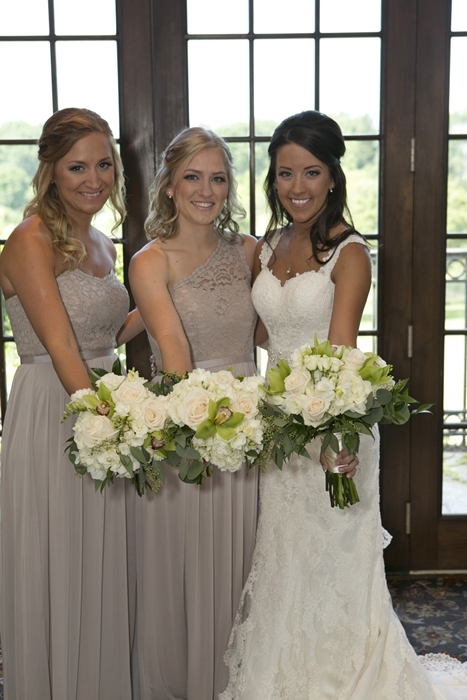 It’s so fun looking at wedding photos. Thanks for sharing. Love, love your blog!! How Lovely–you, your family, the wedding party–all of it! Thanks so much for sharing! Very nice. Everyone looks so good. The photos are wonderful. What a beautiful special occasion; thanks for sharing. Your son is so handsome and his new bride is beautiful. Jennifer you looked stunning! Love, Granted in all of you through the blessings from the Lord. Great Family! Mainly a testimony of what it means to share 2 families on ONE❤ To the new couple: love and fear towards God and He will granted wisdom to both of you in bringing forth a new Family as a testimonial of your lives! Cruzita???????? Just getting caught up on the many emails in my mailbox! I love this! Everything looks so beautiful ! Thanks for sharing this special day.